Also serving communities of Meadows Place. There are 96 Assisted Living Facilities in the Sugar Land area, with 10 in Sugar Land and 86 nearby. The average cost of assisted living in Sugar Land is $3,563 per month. This is higher than the national median of $3,346. Cheaper nearby regions include Missouri City with an average starting cost of $2,916. To help you with your search, browse the 432 reviews below for assisted living facilities in Sugar Land. On average, consumers rate assisted living in Sugar Land 4.3 out of 5 stars. Better rated regions include Missouri City with an average rating of 4.6 out of 5 stars. Caring.com has helped 8 families in Sugar Land find high-quality senior care. To speak with one of our Family Advisors about assisted living options and costs in Sugar Land, call (855) 863-8283. One of Safe Choice's top cities for retirement in 2018 is Sugar Land, Texas, a quiet suburb of Houston with an 11.8 percent senior population. Many seniors enjoy the planned activities and socialization offered at the Sugar Land Senior Center. This quaint community is a nice place to retire into assisted living, and there are 61 total assisted living facilities in the Sugar Land area. 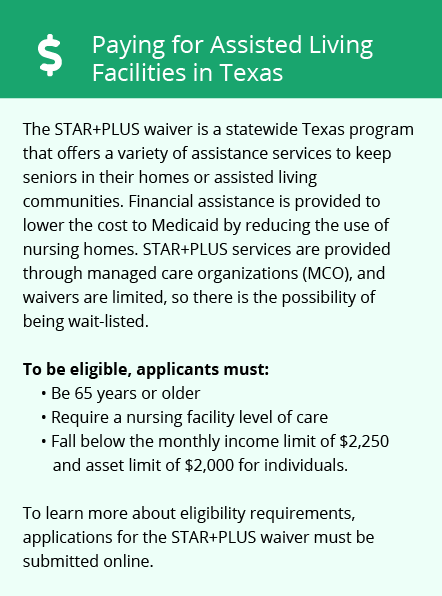 The Texas Department of Health and Senior Services licenses and monitors these assisted living facilities, which are divided into two classes, based on residents' ability to evacuate in an emergency and the degree of staff supervision needed overnight. North Texas is known for long, hot summers and mild winters. Seniors who are sensitive to the heat may not enjoy living here. July average high temperatures are 93 degrees; average January highs are 44. Sugar Land's cost of living is 116.8, based on a U.S. average of 100. Healthcare and grocery costs, important to those in assisted living homes, are lower than the national average. Housing costs are substantially higher in Sugarland, making the average monthly cost of ALF a little higher here. Sugarland violent crime rates are noticeably lower than the national average, at 1.7 compared to the U.S. average of 31.1. Property crimes are just slightly under at 31.6 compared to the U.S. average of 38.1. While seniors in assisted living may not be vulnerable to package theft or car break-ins, they are still advised to care for their belongings. Sugar Land seniors have several options for public transportation, including door-to-door service to Texas Medical Center. Some seniors, or those with a qualifying disability, may be eligible for reduced rates from the Fort Bend County Public Transit system. The Sugar Land area is home to world-class medical facilities, including Memorial Hermann Sugar Land Hospital and Texas Health Systems hospital branches, in the event of medical emergencies or illness. Sugar Land, as a suburb of Houston, is a member of the AARP Network of Age-Friendly Communities, meaning that its elected leadership “has made the commitment to actively work toward making their town, city or county a great place for people of all ages,” according to AARP. Assisted Living costs in Sugar Land start around $3,563 per month on average, while the nationwide average cost of assisted living is $4,000 per month, according to the latest figures from Genworth’s Cost of Care Survey. It’s important to note that assisted living rates in Sugar Land and the surrounding suburbs can vary widely based on factors such as location, the level of care needed, apartment size and the types of amenities offered at each community. The Texas Department of Health and Human Services can help seniors find assisted living homes in Sugar Land within their budget and that provide the level of care they require. Seniors who receive Medicaid or Medicare benefits, or who receive SSI income, may be eligible for assisted living financing. The STAR+PLUS serves specific areas of the state and may help provide an alternative to nursing home care. 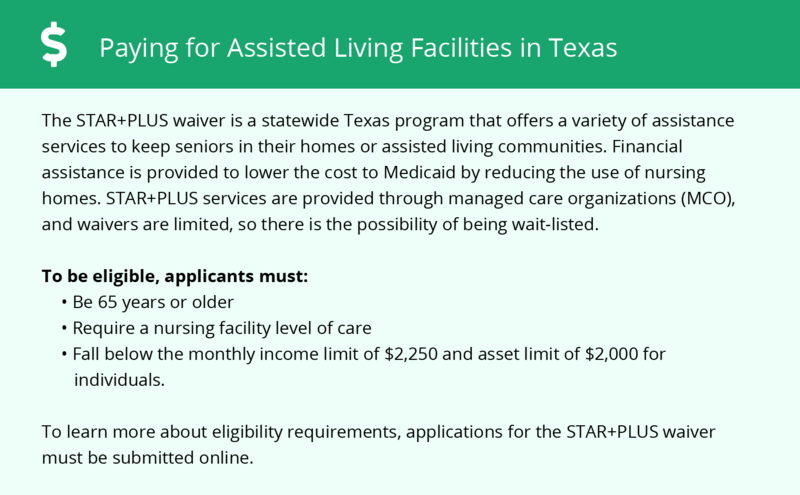 Learn more about these programs, plus who’s eligible, on our Assisted Living in Texas page. For more information about different ways to finance assisted living, visit our Assisted Living in Texas page. Sugar Land and the surrounding area are home to numerous government agencies and non-profit organizations offering help for seniors searching for or currently residing in an assisted living community. These organizations can also provide assistance in a number of other eldercare services such as geriatric care management, elder law advice, estate planning, finding home care and health and wellness programs. To see a list of free assisted living resources in Sugar Land, please visit our Assisted Living in Texas page. Sugar Land-area assisted living communities must adhere to the comprehensive set of state laws and regulations that all assisted living communities in Texas are required to follow. Visit our Assisted Living in Texas page for more information about these laws.